Set amidst mature grounds of approximately an acre, this imposing residence was meticulously designed and constructed to a precise specification. The elevation is finished in a reclaimed red brick and the dwelling is centrally sited to make best use of the private grounds and panoramic views. Within such an extensive property (c.7,000 sq.ft.) the proportions of each room maximise the social areas with the principal rooms making the most of the privacy and natural light. The generous reception hall leads to an open formal dining area, gracious drawing room with feature bay window and fireplace and a study or snug. The ample kitchen is fully fitted in hand crafted units complete with a full range of designer built in appliances, island unit, casual dining area and doors to the side patios and living room. Two cloakrooms, a store and a full utility room complete the ground floor accommodation. There is an impressive staircase leading to the first floor, there are 4 bedrooms, 3 with shower facilities and a family bathroom, plus the master bedroom suite which includes a full dressing room and bathroom. The second floor provides three further rooms, and a shower room. Please view floor plans to the rear of this brochure for clarity. Externally the grounds are laid in lawns with patio areas and mature trees and shrubs. The driveway leads around the property with a detached double garage and carport. 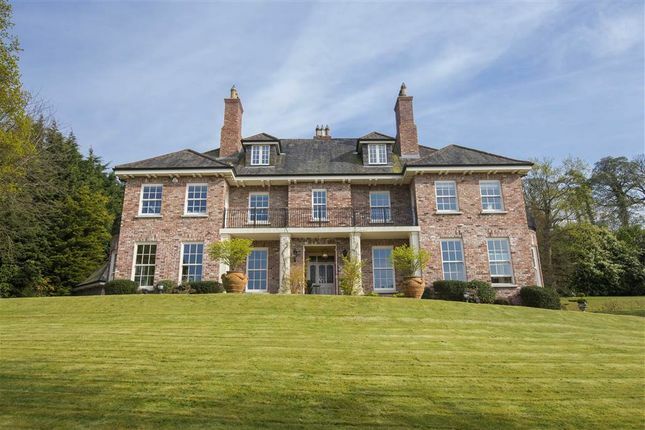 This is an outstanding home in one of North Down's most sought after residential settings affording easy access to the local amenities of golf and yacht clubs, the Elysium at the Culloden Hotel and a number of Northern Ireland's most highly regarded schools. Holywood town is within walking distance and includes many good eateries and an eclectic range of retail businesses. The transport links of the city's air and sea ports are reachable in under 20 minutes by the road or rail networks. Viewing is strictly by private appointment.